Soil salinity is one of the major environmental stress factors limiting crops growth, development, and productivity worldwide. The aim of this study was to compare differences of salinity tolerance between diploid (cv. TY03209) and tetraploid (cv. TY03410) seedlings of sugar beet (Beta vulgaris L.) treated with various concentrations (0, 50, 100, 200, and 300 mM) of NaCl. Our results indicated that fresh weight (FW) and dry weight (DW) of shoot in tetraploid were remarkably higher than those in diploid when subjected to various concentrations of NaCl (except for FW under 200 mM). At 200 and 300 mM NaCl, tetraploid obviously accumulated less Na+ in its shoots and roots compared with diploid. However, there were no differences in K+ accumulation between tetraploid and diploid under salinity stress. Our results also showed tetraploid displayed a smaller Na+/K+ ratio and a stronger selective capacity for K+ over Na+ than diploid when exposed to high-salt stress (300 mM). Furthermore, it was observed that tetraploid possessed a bigger net K+ uptake rate and a smaller net Na+ uptake rate compared to diploid at high-salt condition. We also investigated the relative expression levels of six genes related to K+ and Na+ transport in roots of diploid and tetraploid by qRT-PCR method, and found that BvHKT1;1, BvNHX1, BvSKOR, and BvSOS1 were induced by additional 50 mM NaCl, and their transcript abundances in tetraploid were relatively higher than those in diploid. The expression level of BvAKT1 was down-regulated in tetraploid during 3–48 h of salt treatment, whilst basically remained unchanged in diploid. It was observed that the transcript abundance of BvHAK5 in diploid displayed the reduced trend with the prolonging of salt treatment time compared to tetraploid. In addition, soluble sugars contents were obviously higher in tetraploid than in diploid exposed to 100, 200, and 300 mM NaCl. Taken together, these results suggested that tetraploid exhibited more tolerant to salinity stress than diploid in sugar beet by accumulating less Na+ and more soluble sugars, and by maintaining lower Na+/K+ ratio and greater capacity of selective absorption for K+ over Na+. 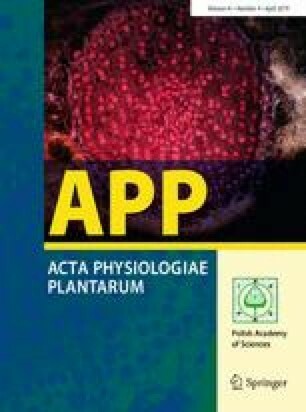 The results of this study provide insights into physiological and molecular consequences of polyploidization in sugar beet. The research was supported jointly by the National Natural Science Foundation of China (Grant nos. 31860404 and 31460101) and the Natural Science Foundation of Gansu Province, China (18JR3RA152). We thank Dr. Chun-Mei Wang for assistance with Na+ and K+ measurement. We are also grateful to Prof. Hua-Zhong Wang, from Heilongjiang University, China, kindly providing seeds of two sugar beet cultivars for this research.